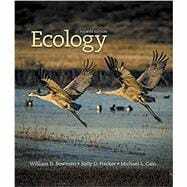 by Bowman, William D.; Hacker, Sally D.; Cain, Michael L.
The new fourth edition of Ecology maintains its focus on providing an easy-to-read and well-organized text for instructors and students to explore the basics of ecology. This edition also continues with an increasing emphasis on enhancing student quantitative and problem-solving skills. A new Hone Your Problem-Solving Skills series has been added to the set of review questions at the end of each chapter. The questions expose students to hypothetical situations or existing data sets, and allow them to work through data analysis and interpretation to better understand ecological concepts. New for this edition, additional Analyzing Data exercises have been added to the Companion Website. These exercises enable students to enhance their essential skills sets, such as performing calculations, making graphs, designing experiments, and interpreting results. Recognizing the increasing evidence and effects of climate change on ecological systems, additional Climate Change Connections have been added. These vignettes help students appreciate the many consequences of global climate change on the distributions and functions of organisms as well as the ecosystems they depend on. Finally, the authors also revised and strengthened key pedagogical features of Ecology. - Hands-On Problem Solving Exercises that provide practical experience working with experimental data and interpreting results from simulations and models. - Analyzing Data Exercises--companions to the in-book exercises that give students extra practice with quantitative skills. - Climate Change Connections explore the links between the ecological concepts and climate change. - Web Extensions expand on the coverage of selected topics introduced in the textbook. - Online Quizzes are a great way for students to check their comprehension of the material covered in each chapter (instructor registration required). - Figures & Tables: All of the textbook's figures (including photos) and tables are provided as JPEGs, both with and without balloon captions, optimized for use in presentations. Complex figures are provided in both whole and split versions. - Hands-On Problem-Solving Exercises: In addition to the instructor versions mentioned above, the student versions of the exercises from the Companion Website, with answers, are included in Microsoft Word format. - Answers to Analyzing Data Exercises: Complete answers for all of the online Analyzing Data companion exercises. - Diploma (software included): Diploma is a powerful, easy-to- use exam creation program that lets you quickly assemble exams using any combination of publisher-provided questions and your own questions. - Blackboard: Question bank files ready to import into your Blackboard course. The Companion Website includes an online quiz for each chapter of the textbook. Via the instructor's website, these quizzes can be assigned or opened for use by students as self-quizzes. Custom quizzes can be created using any combination of publisher-provided questions and instructor-created questions. Quiz results are stored in an online gradebook and can be exported. William D. Bowman is Professor at the University of Colorado at Boulder, affiliated with the Department of Ecology and Evolutionary Biology, Mountain Research Station, and the Institute of Arctic and Alpine Research. Sally D. Hacker is Professor at Oregon State University, Corvallis, where she has been a faculty member since 2004.